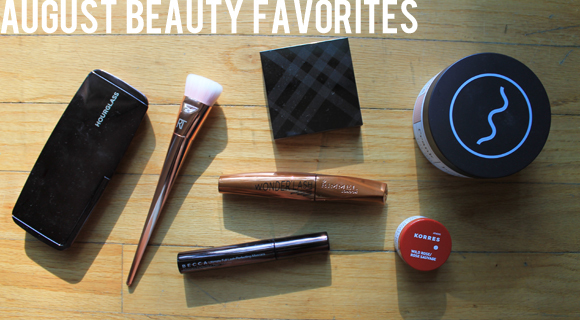 less is more: august beauty favorites. 1. 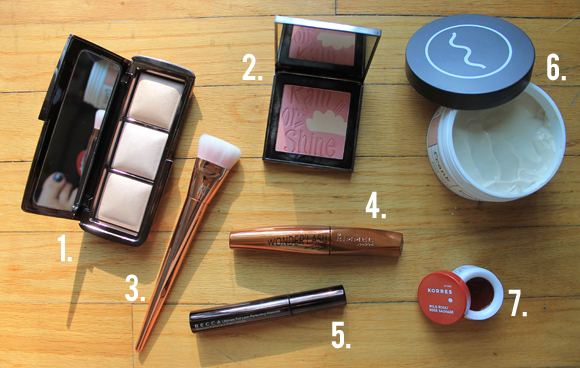 Hourglass Ambient Lighting Palette // 2. Burberry Runway Blush and Highlighter // 3. Real Techniques Flat Contour Brush // 4. 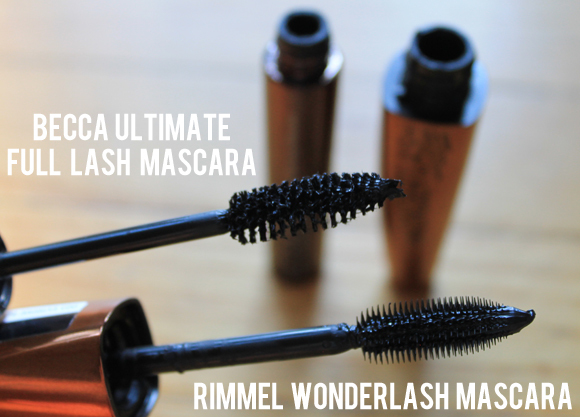 Rimmel Wonderlash Mascara // 5. Becca Ultimate Full Lash Perfecting Mascara // 6. Frank Body Balm // 7. Korres Lip Butter in 'Wild Rose' It's been a while since I did one of these, because to be honest I haven't had that much changeup in my beauty routine. But now that my work bestie is a beauty editor, the recommendations are flooding in and it's almost as if I started watching youtube beauty vids again but with personal tips, therefore more desire to try (and buy, ugh) things. Mascara has always been my favorite, so I tried out two over the last month and a half, and they're both awesome. The Becca mascara has a thick fiber brush, so it coats and volumizes, and the Rimmel separates and lengthens. Together they're the perfect pair, but they're awesome separately, too. 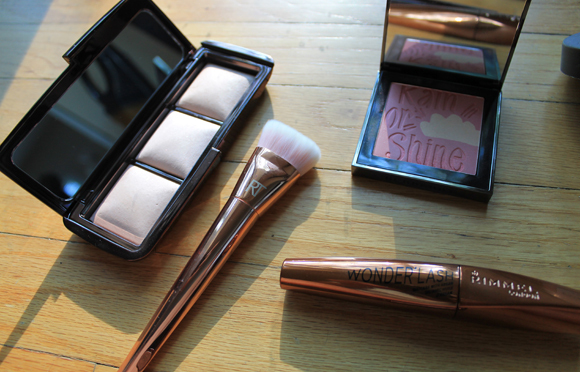 The highlighter palette is amazeballs. The middle shade, Incandescent Light, is a great brow and inner eye highlight, and Radiant Light is the perfect highlight for my summer skin right now. 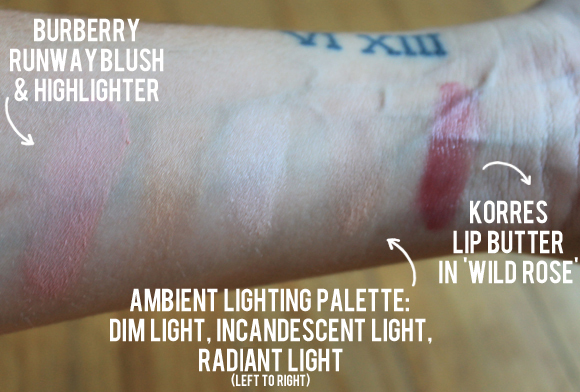 The left shade, Dim Light, is a little bit too pink for my skin, but over blush it works. The contour brush is something I've been looking for a while now, and I love it — the hairs are very packed, but real soft. The blush looks scary, but it's actually pretty light, and took me forever to even get it to show on camera. The lip butter is the perfect amount of color for everyday, but because it's a butter it rubs off pretty easily — it's so beautiful though, it's worth the constant reapplying. And finally, the body balm is really just a good lotion, but it smells delicious and keeps skin smooth for a while.